Hi Everyone! I’m Laurie from Gallamore West and I’m thrilled to be here at Happiness is Homemade for my 1st contributor post. I’m a busy mom of 4 little boys who fill my days with nonstop fun, giggles, and more than my fair share of mud! Today I’m sharing my DIY No-Sew Garden Flag with you. It’s a super fun and easy project that is a great finishing touch to our Halloween Burlap and Broomsticks front porch decorations. First, cut your burlap. Cut it the width that you actually want it to be, but make sure you make the length about 2- 3 inches longer than you actually want so you can make a pocket. To make a pocket to hang the flag from the garden flag pole, I just folded over a couple of inches to the backside of the top of the flag and glued it down. Next, choose your stencil. If you don’t have a Silhouette or other cutting machine, that’s okay. 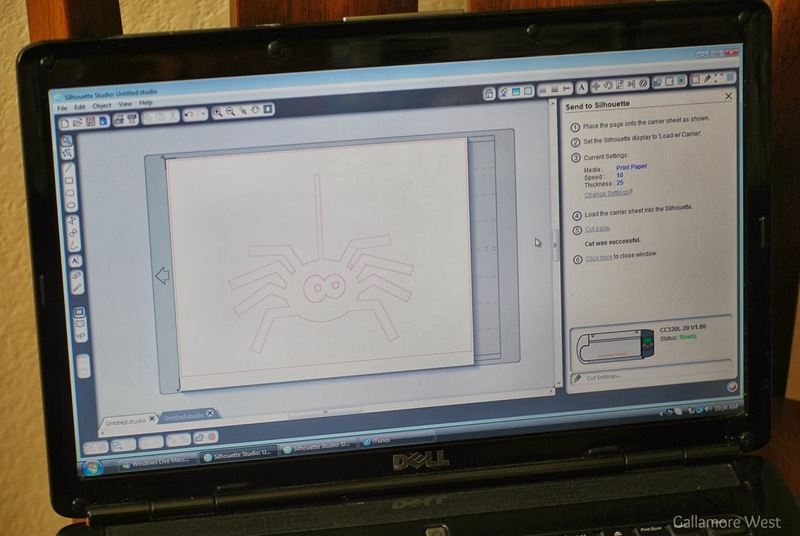 Just print any shape you want on your computer, and make a stencil out of it! I used my Silhouette to cut out this cute spider on freezer paper. 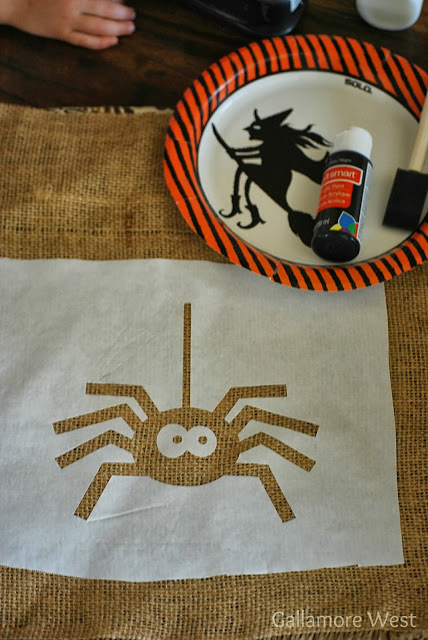 Iron your stencil onto the burlap on the highest setting with the shiny side of the freezer paper facing down onto the burlap. Freezer paper is amazing for creating stencils on fabric because it works great and it’s super cheap! You can find it with the plastic bags and aluminum foil in your grocery store. Once your stencil is ironed on well, grab your paint and paint brush and fill in the stencil with paint. Allow it to dry. 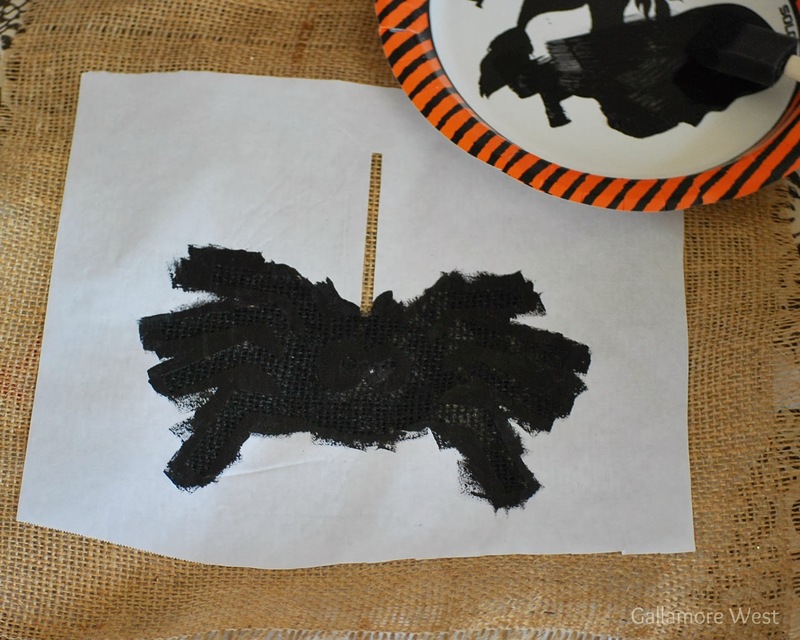 Once my cute spider was dry (it took just a couple of minutes), pull up the freezer paint, toss it out, and start embellishing. I just used a bit of ribbon to add the string he’s hanging from and a couple of accent ribbons along the bottom using my hot glue gun. Optional: To keep the edges of the burlap from fraying too much, gently brush on fabric stiffener along all of the edges using a foam paint brush (I used Stiffy brand). That’s it! It took less than 30 minutes and just a couple of dollars to make because I used supplies I already had on hand. 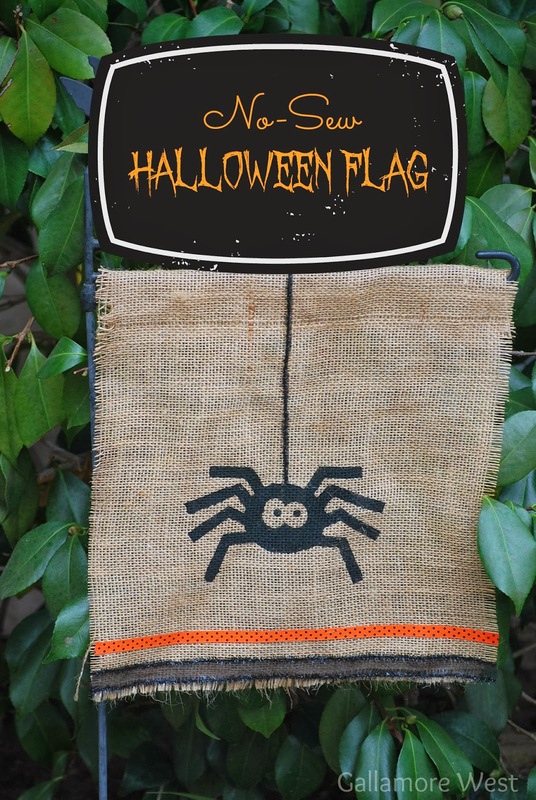 And I’m loving how it ties together our Halloween Burlap and Broomsticks front porch. So Cute Laurie! I love it! What an easy flag…makes me think, I need to switch mine out! 🙂 Cute Cute Cute!